Still looking for that last minute Halloween dessert? 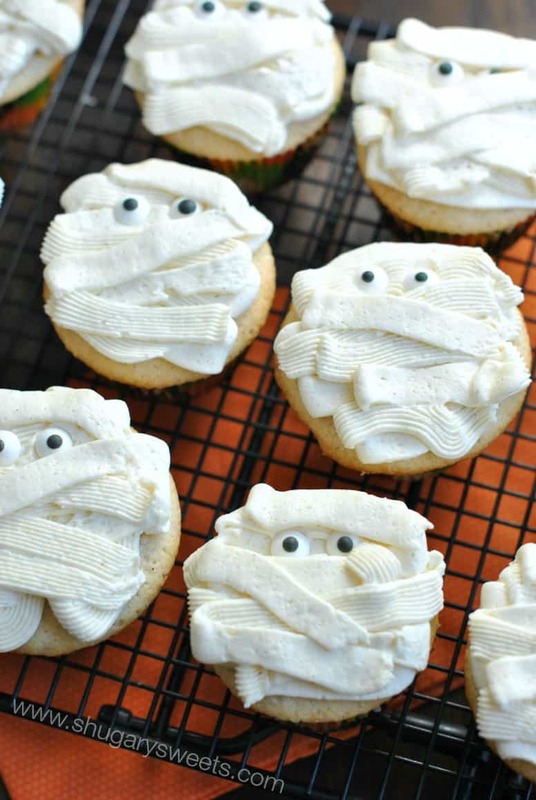 These Vanilla Bean Cupcakes are made from scratch with the perfect decoration: MUMMY faces. I’m not a huge fan of Halloween. I can’t help myself for admitting this. We have friends (hi Kari and Greg) who go all out this holiday. They celebrate enough to cover my lack of enthusiasm. It’s not that I don’t like candy. Or googly eyed treats. Nope. Love those. It’s not that I don’t like chili or comfort food this time of year. So, instead of talking about the things I don’t like…let’s focus on the good parts. 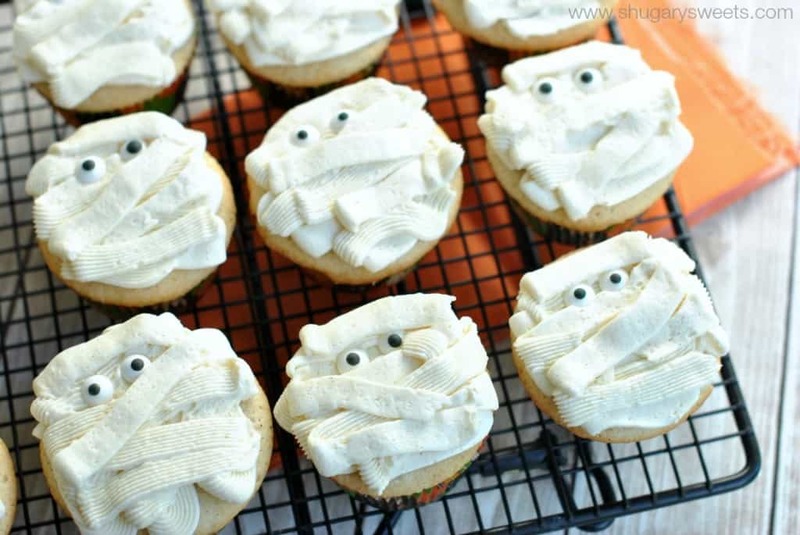 I made these Mummy Cupcakes for the first time several years ago for my daughter’s Halloween party at school. They were so easy to decorate, I wanted to make them again for our friends (mentioned above) Halloween party. Actually, it was a “pre-Halloween party.” Officially it’s called the “set up” party. They do a great spooky garage, and everyone comes to help set up and decorate. Or, in my case, eat. , I alternated my stripes with the smooth side and the basket weave side to give the mummy stripes texture. I added the candy eyeballs too (I bought mine at Target). And there you have it. 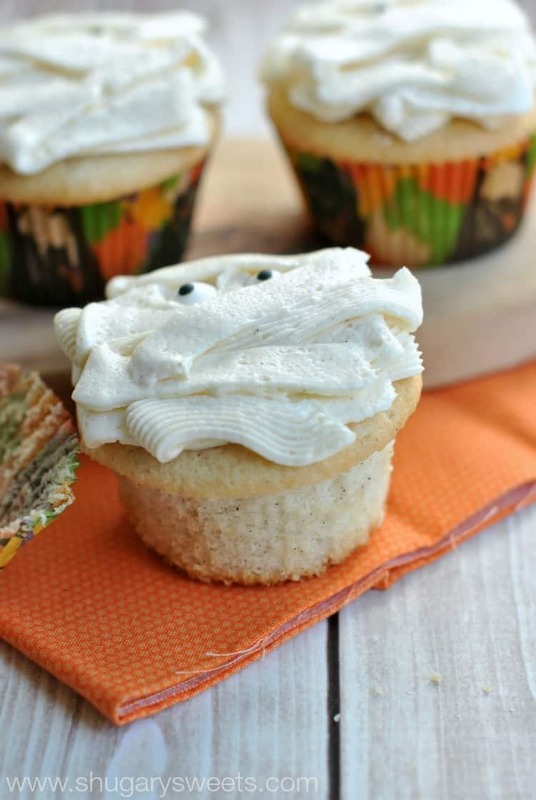 Totally moist, delicious vanilla bean cupcakes. Perfect for Halloween. Get baking! For the cake, whisk together the egg whites, vanilla bean paste and 1/4 cup milk in a small bowl. Set aside. In a large mixing bowl, beat the butter and sugar for 2 minutes. Add in dry ingredients and mix until combined. Slowly add in egg mixture, beating until fully incorporated. Beat in the remaining 1/2 cup milk. Turn mixer on high and beat for 2 minutes. Fill cupcake liners 2/3 full and bake in a 350 degree oven for 17-18 minutes, until set (will begin to lightly brown on edges). Remove and cool completely before frosting. For the frosting, beat butter for 5 minutes until pale in color. Add sugar, vanilla bean paste and milk. Beat an additional 5 minutes until light and fluffy. 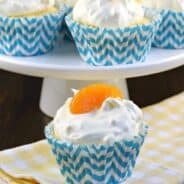 Pipe onto cupcakes by filling pastry bag and using tip 48, pipe "stripes" onto top of cupcakes. Add candy eyes. ENJOY! Looking for more fun Halloween Ideas? First, check out my Halloween Pinterest Board! 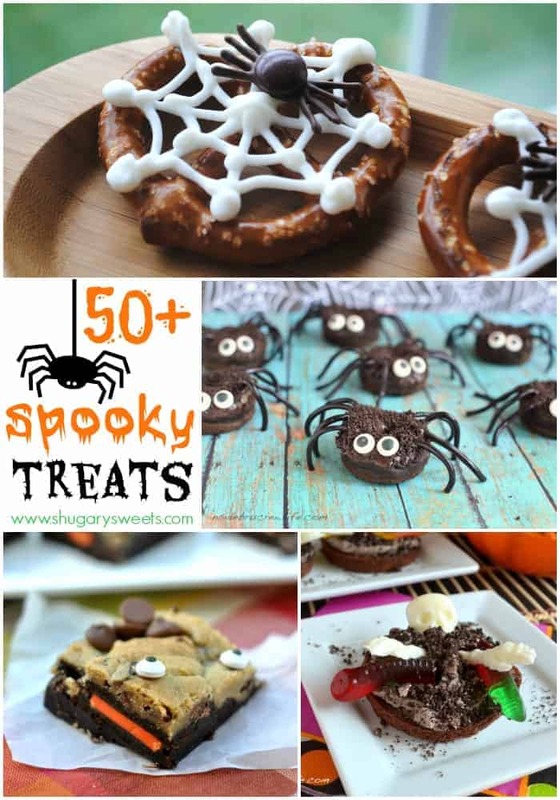 Follow Shugary Sweets’s board Halloween and Fall Stuff on Pinterest. 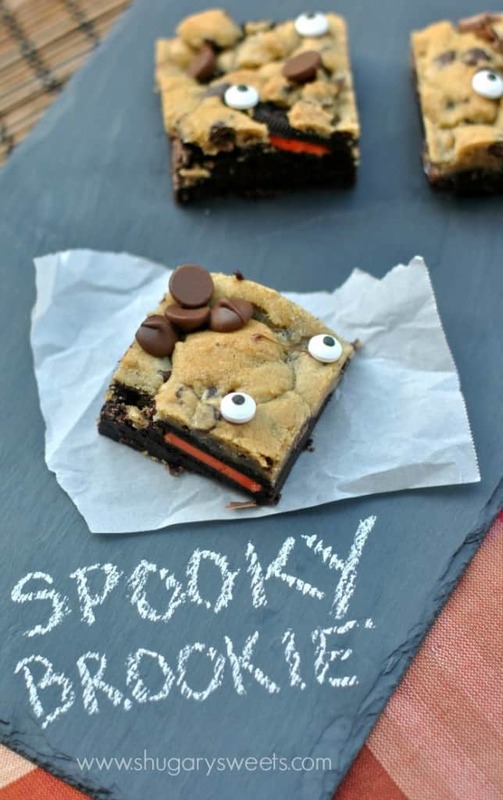 Spooky Brookies: easy layered treats for Halloween! Monster Sugar Cookies: let the kids help decorate these fun frosted sugar cookies! 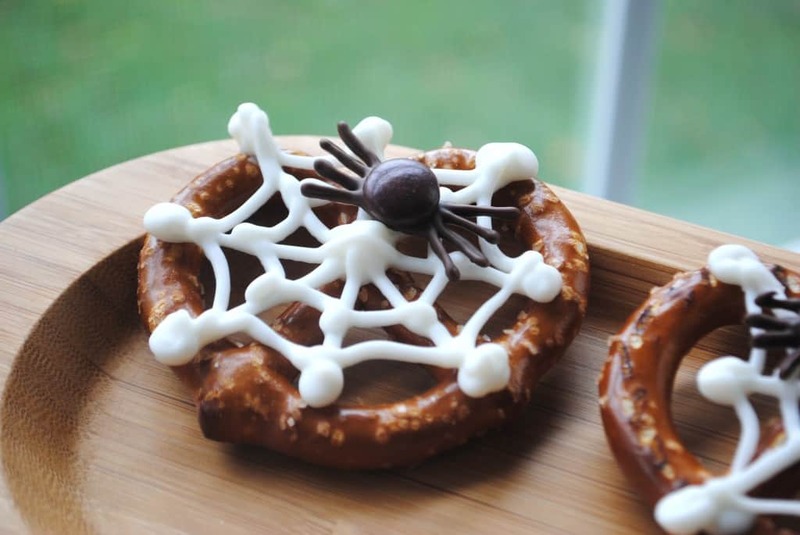 Spider Pretzels: easy tutorial on making these cute webbed treats! Still need more ideas? 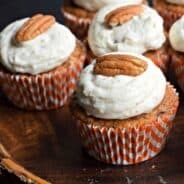 Check out this list of over 50 Spooky Treats! CUTE! 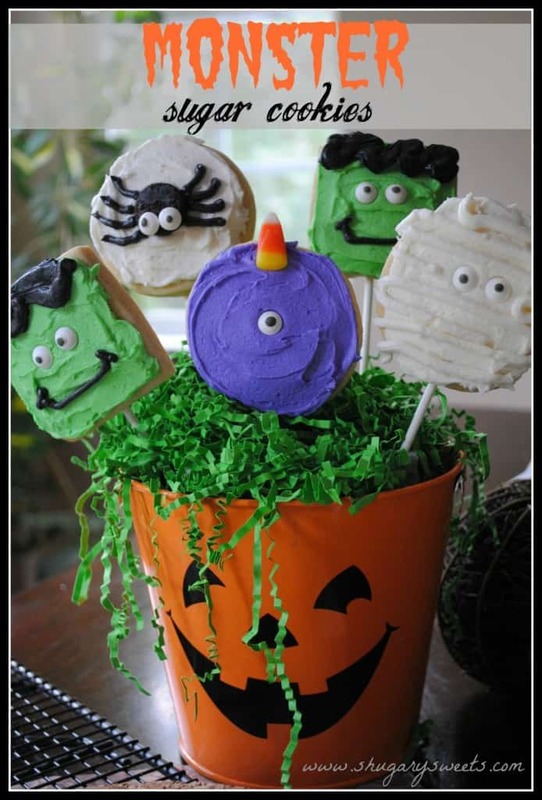 I would totally make them for my kid’s Halloween party but they have a “store-bought only” rule that drives me nuts! Whew! I’m not the only one. Halloween is a scary, scary holiday. I’m not too into being scared. So yeah. Thanksgiving is better! These are cute, though. Super adorable. Love the mummy theme! Probably my favorite Halloweeny thing so far this year! I can’t lie. I ADORE Halloween. Especially when it involves eating these ADORABLE cupcakes. They’re almost too cute to eat. Only almost though. These are so cute and look delicious! I love the little flecks of vanilla bean. Super cute and vanilla bean makes everything better! These are so fun! 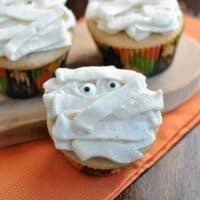 My kids will go crazy for these cupcakes! I feel exactly the same way as you about Halloween. I love the candy and treats, but costumes are creepy… ESPECIALLY clown costumes!! But these cupcakes? Are the cutest ever! Love them!! Nope! No clowns! The movie IT ruined me forever. And there was this other really old movie I saw as a kid, Killer Clowns from Outer Space. Completely freaked me out! At 32, I’m still not over it. These cupcakes are adorable. So creative and fun! Love that you used two different tips! I love the contrast of textures 🙂 We’re spending Halloween with our friends who have kids…this looks like the perfect activity! These are the cutest cupcakes I have ever seen!! So fun! I am with you Aimee. I am not a big fan of Halloween either. I could do with skipping it if I didn’t have kids. I just hate having to pick out costumes every year that they are only going to wear one or two days at the most, then all the candy. I have to either bake with it or throw it away when they are at school of course, cause they would be mad at me if they knew. 🙂 Pinned these cuties. We do love all things Halloween around here, but we don’t go all out for it. I have a vase of skeleton parts and a few signs up. Oh, and the dust that is piling up counts right? 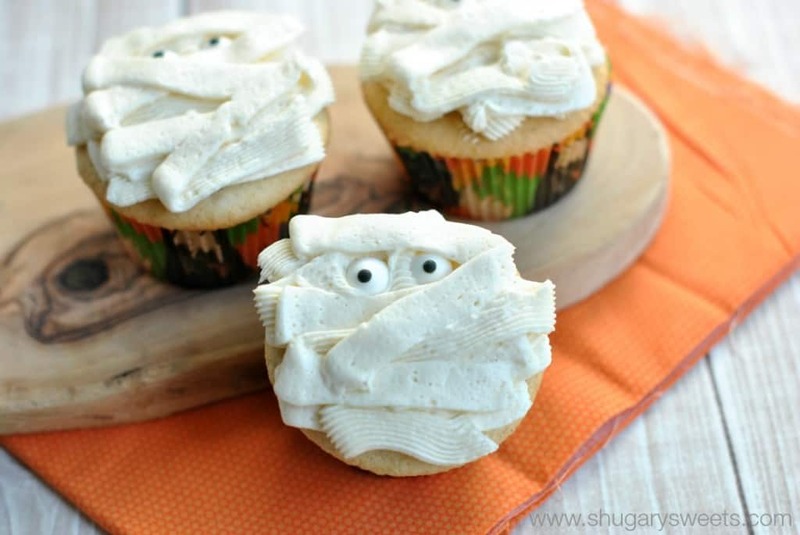 These are the cutest little mummy cupcakes…love the alternating strips for contrast! I am not a fan either!! But I am a fan of these cupcakes! These are seriously the CUTEST! 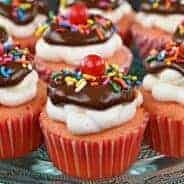 So I just volunteered to make cupcakes Friday for my daughter’s class, and I was looking for something easy! This looks right up my alley! Plus I just bought some vanilla bean paste and I couldn’t wait to use it! These are adorable! Clowns? Eek, no thank you. I am not a fan of the creepy treats either and love how perfectly cute and spooky these are. Pinning. 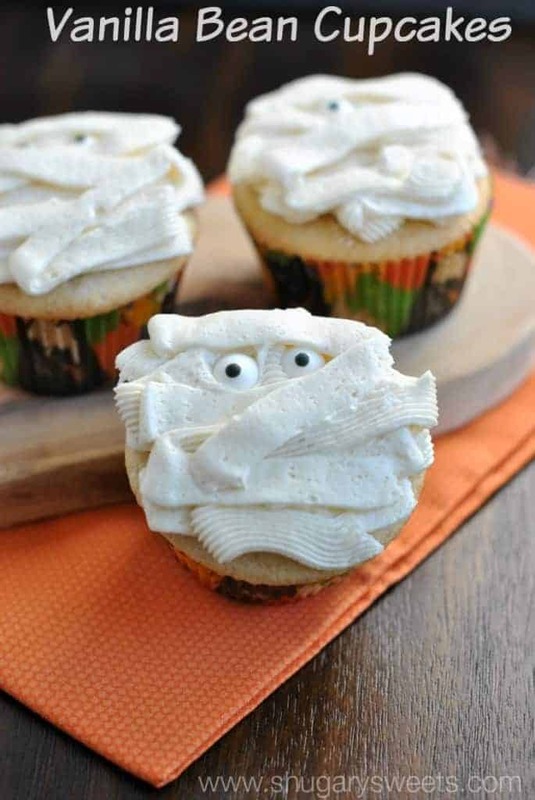 these mummy cupcakes are adoooorable!! And I’ll take from-scratch vanilla bean cupcakes over packages processed ones any day! Clowns are the worst! I’m with you, Halloween isn’t my favorite holiday. I hate spending extra money on costumes. However, I will eat me some Halloween goodies. These are too cute. I too much prefer cakes that are made from ‘scratch’ over any packet-mix, more economical, they’re much tastier, I know exactly what goes into them! I’ve made these cupcakes several times now & they always turn out perfect…. I have even adapted them by adding toasted chopped Pecans to the mix as I adore them, imagine my sheer delight when I saw your wonderful, special ‘Pecan Pie Cake’, it’s a brilliant recipe, superb for any occasion. This will take pride of place on my Holiday Table, at Christmas, birthdays & on any other occasion that I may have the opportunity to make it, or just because I fancy it-which is every time I think of cakes…Everyone that’s tasted it says the same thing, it’s gorgeous can I have the recipe please or will you make me one! A true winner each & every time, I can’t thank-you enough, it’s got it all. Moist flavorful, tender sponge cake, filled with caramel pecans, frosted & decorated to perfection. You ought to win an award for the best, finest, delectable cake…Amazing!!! I simply want to mention I am just newbie to blogging and site-building and really loved your web page. Almost certainly I’m planning to bookmark your blog . You surely come with incredible posts. Thanks for sharing your web page.